Matt vs. Math is a fun brainteaser game in which you have to solve seemingly simple equations that are designed around the numbers 1, 2 and 3. Three numbers, two operators and three results to choose from, this is all it takes to make really great game. Does this sound easy as 1, 2, 3 to you? Does it even sound too easy to you? Well, the first levels are easy indeed. 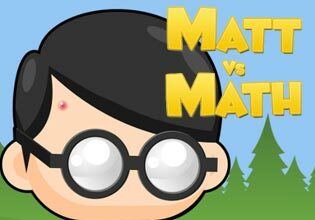 But after a solving a few more equations and playing for some minutes, the game will quickly become a challenging and highly addictive brainteaser!Play Matt vs. Math now and solve more than 130 levels full fun and hard challenges!